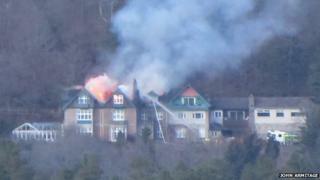 The fire at the 130-year-old Darroch Learg Hotel in Ballater, which broke out at about 15:50 on Friday, was contained to the roof and upper floor. Scottish Fire and Rescue crews remained at the scene overnight. There were no injuries. The A93 was closed at Ballater as a result of the fire.